Members of the Mass Choir sing a hymn during the opening worship of the United Methodist Church's 2004 General Conference in Pittsburgh. The church's top legislative assembly is meeting April 27-May 7. Different voices joined in a common song as the 2004 United Methodist General Conference officially opened with an April 27 worship service at the David L. Lawrence Convention Center. In the afternoon’s traditional Episcopal Address, Bishop Kenneth L. Carder of the Mississippi Area told the nearly 1,000 delegates that God is calling the church to be a sign and instrument of a new creation. 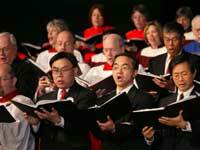 Members of the Mass Choir sing a hymn during the opening worship of General Conference 2004. A UMNS photo by Mike DuBose. But the denomination’s bishops also expressed concern about the international delegates who didn’t make it to the church’s top legislative meeting because they were denied visas by the U.S. government. About 25 delegates from Africa and the Philippines were unable to travel to Pittsburgh because of visa problems. In his sermon, Bishop Ruediger R. Minor of Moscow, president of the Council of Bishops, remembered being sent to Russia 12 years ago and discovering that baptism was not about a few drops of water, but being scrubbed clean. Bishop Kenneth L. Carder delivers the Episcopal Address during the opening day of the General Conference. A UMNS photo by John C. Goodwin. In his later address, Carder reminded General Conference participants that while the church has extraordinary opportunities to live into God’s vision of a healed creation, it is lacking in vision, will and financial commitment. The Episcopal Address is the only time the Council of Bishops addresses General Conference. Bishops preside over plenary sessions, deliver sermons and participate in worship, but have no vote at the assembly. A proposal from the Committee on Plan of Organization and Rules of General Conference to have bishops chair each of 11 legislative committees — rather than continuing the tradition of electing lay or clergy delegates to fulfill that role — was narrowly defeated by delegates. The bishops may expand their current Bishops’ Initiative on Children and Poverty, according to Bishop Donald A. Ott, coordinator, to focus on points raised in the Episcopal Address. The proposed new initiative would reclaim the bishops’ responsibility to be teachers of the church, Ott said. In a lunchtime press conference, the bishops also expressed concern over the initial denial of visas to 42 delegates from Africa and the Philippines, and called the visa process both racist and unjust. By the time General Conference convened, 25 still did not have visas and were unable to attend. White European delegates had no problems securing visas, Bishop Felton E. May of Washington pointed out. During the afternoon plenary, delegates remembered one prominent United Methodist and heard greetings from another. The passing of Boris Trajkovski, the president of Macedonia who was killed in a February plane crash, was marked by a moment of silence. First lady Laura Bush, a lifelong United Methodist, sent personal greetings to the assembly, thanking delegates for their hard work. President and Laura Bush had received an invitation to appear at General Conference. Some 82,500 cookies, compliments of church members throughout Western Pennsylvania, are being provided during breaks at General Conference. Convention center rules required the cookies to be placed in sealable plastic bags, three to a pack, labeled and placed in pizza boxes for delivery.